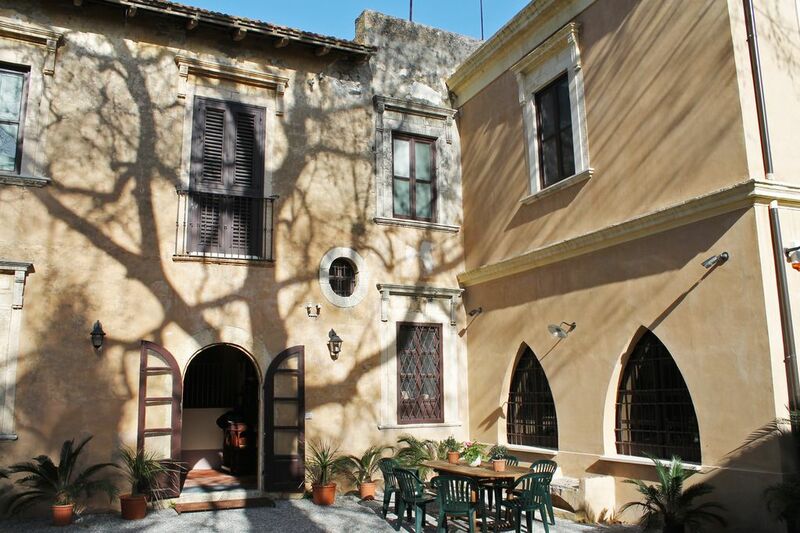 The villa is an ancient manor house built in 1834 on an estate in the agricultural plain of Santa Marina di Milazzo. The unit has been the object of a complete restoration in 2015 that covered the interiors, the period furniture, the ancient frescoes and all the functional technological systems. The house develops 300 square meters on two floors: on the first floor, there are 4 large double and triple bedrooms, 2 separate terraces and two bathrooms. On the ground floor, there are: the entrance, a large kitchen, two dining rooms, a study and a living room with a sofa bed and 2 bathrooms, a service bathroom, a pantry and other accessories. The house has satellite TV, Internet plugs in every room and free Wi-Fi and is equipped with heating for the winter and the 4 upper bedrooms have air conditioning. On the inside it has a patio of about 90 square meters, in the shade of a centuries-old plane tree, well lit, equipped with tables, chairs and umbrellas for pleasant evenings outdoors. Near the town of Santa Marina there are essential services: post office, church, tobacco shop, newsagent, pharmacy, grocery stores. The villa is about 4 km (7 minutes by car) from the town and the port of Milazzo for the nearby Aeolian Islands. About 1 km from the house, the long west beach of different miles begins, with private beaches and bathing facilities. On the promontory of Milazzo, a peninsula of about 5 km on the Tyrrhenian Sea, there are numerous coves, inlets, natural pools immersed in the cliffs, sea caves and panoramic points. The owners have a small sailing catamaran of ml. 7.50 with auxiliary engine with comfortable capacity up to 8 seats and a small rubber boat of 4.50 m. useful to land on the beaches unreachable from the ground. The vehicles are available at the request of the guests for daily guided tours of the Milazzo peninsula and are conducted directly by the owners. The villa is 3.8 km from the Milazzo motorway exit, ½ hour highway from Messina, 1 hour to Taormina, about 1 hour and ½ from Catania airport, which is connected to Milazzo with a private bus service and taxi . Milazzo is a town where you can see the signs and monuments of a past rich in history. The impressive and impregnable Castle of the Arab-Norman period (11th century), the sanctuary created in a cave of St. Anthony of Padua (12th century) and the church of San Francesco di Paola, built by the thaumaturgist in the 15th century, is evocative. .), the ancient village, the many churches of the seventeenth century and the numerous buildings in the historic center of Milazzo where many restaurants, bars, pubs, night clubs are located. The port is home to connections and departures for excursions and mini-cruises to the nearby 7 Aeolian islands, located the nearest ones to 1 hour away. In Milazzo you go, during these years, increasing a sustainable tourism made of sun, sea, leisure, culture and without the disadvantages of mass tourism, as in other more known places. We had a fantastic family holiday at Sainte Maria, the space was a luxury. Spacious bedrooms, a wonderfully large and well equipped kitchen, several sitting rooms that we never used, 4 modern shower rooms equipped with hairdryers. The outdoor terrace is where we spent most of our time, relaxing, dining and BBQ. Internet. Our lovely hosts Martina and Alberto were just so welcoming and attentive , it was thanks to them that our holiday was so special. They gave us many places to visit, the best beaches and most importantly their favorite local food shops which we used daily. The beaches were only a quick car ride away and there was a different one for every day. This was definitely a five star house. It's a wonderful place situated close to Milazzo and only a few minutes drive to the coast. The villa easily accommodated 7 adults and 2 children. There is lots of space to roam around inside and outside, including a large terrace and garden. It's an interesting building with a lot of fascinating details that also offers all the modern facilities. The family running the villa were very friendly and helped us out whenver we needed it. Overall a highly recommended place to stay. La casa è molto bella, antica ma con ogni comodità. Camere molto spaziose, elegante zona pranzo, cucina grandissima ed equipaggiata davvero di tutto. Ambiente intorno simpatico e sicuro. Padroni di casa di squisita gentilezza, danno una perfetta accoglienza. Le calette del mare di Milazzo, viste dalla barca e attraverso gli occhi del signor Alberto, sono magnifiche. La spiaggia più vicina alla casa (15 minuti a piedi) è molto ampia e non affollata. Bella esperienza! Grazie per le vostre parole. Siamo molto onorati di avere ospitato delle persone di classe come Voi che sanno apprezzare quel poco che offriamo a casa e nel contesto di un posto di mare gradevole come Milazzo. Séjour parfait à Milazzo. La maison est très bien équipée, vaisselle, électroménager, mobilier...Alberto a résolu immédiatement un problème de climatisation un dimanche soir à 21h, pour notre confort, il fait tout pour que l’on se sente bien. Il nous a emmené faire une croisière dans la baie, les enfants ( et parents) ont été ravis de cette journée sur son bateau. L’accueil de Martina et Alberto est exceptionnel. On se sent parfaitement bien dans la maison qui est grande. Ce sera un super souvenir de vacances. Sehr nette Gastgeber, sehr hilfsbereit mit sehr guten Tipps. Unterkunft war der Hammer. Das Haus war einfach genial wenn man auf alte Häuser steht. Innen war alles sehr reinlich und neu hergerichtet was aber den Stil dieses Hauses nicht störte. Die Gastgeber waren immer erreichbar und sehr nett. Sie gaben uns Tipps was in der nähe gerade aktuell war und waren per Whatsapp immer zu erreichen. Sie waren nicht aufdringlich Alberto kam einmal in 11 Tagen vorbei und fragte ob alles ok ist. Sonst per Wathsapp. Uns gefiel es sehr gut und wir hatten auch keine Probleme mit den Nachbarn (Party bis 2 Uhr früh) Im gegenteil wir setzten uns mit Ihnen auf die Bank und unterhielten uns so gut es ging. Wir wurden von Ihm auch auf ein Glas Wein eingeladen und er schenkte uns Tomaten und Zuchini. Einfach perfekt. Der tägliche Gemüseservice um 9 Uhr und der Kreisler um die Ecke waren perfekt wenn man mal einen Tag nicht wegfahren wollte. Milazzo mit dem Pool of Venus der Kirche und dem Hafen (Ausgangspunkt für Vulcano Stromboli) sind 10 Minuten entfernt gewesen. Genauso der Lidl und Spar. Der Strand war Kilometerlang und mit dem Rad in 5 Minuten zu erreichen. Alles in allem. Perfekt. Alberto und Martina Immer wieder. Danke das wir eure Gäste sein durften. A wonderful historical building, lovely renovated and furnished, perfectly equipped. The landlords are extraordinary cordial and generous. A perfect place to stay. Quiet and quiet area of ​​the plain of Milazzo, located a short distance from the beach and the town, connected by an easy coastal road overlooking the Aeolian Islands. Within 500 meters, essential services, church, grocery stores, supermarket, post office, pharmacy, tobacconist, newsagent, shops and various private services. About 1 km from the house, the long west beach of different miles begins, with private beaches and bathing facilities. On the promontory of Milazzo, a peninsula of about 5 km on the Tyrrhenian Sea, there are numerous coves, inlets, natural pools immersed in the cliffs, sea caves and panoramic points. The villa is 3.8 km from the Milazzo motorway exit, ½ hour highway from Messina, 1 hour to Taormina, about 1 hour and ½ from Catania airport, which is connected to Milazzo with a private bus service and taxi . Milazzo is a town where you can see the signs and monuments of a past rich in history. The impressive and impregnable Castle of the Arab-Norman period (11th century), the sanctuary built in a cave of St. Anthony of Padua (12th century) and the church of San Francesco di Paola, built by the thaumaturgist in the XV . ), the ancient village, the many churches of the seventeenth century and the numerous buildings in the historic center of Milazzo where many restaurants, bars, pubs, night clubs are located. The port is home to connections and departures for excursions and mini-cruises to the nearby 7 Aeolian islands, located the nearest ones to 1 hour away. Le tariffe sono soggette a modifiche sino a conferma della prenotazione. Alla prenotazione è richiesta una caparra di € 200.